A group of kids in San Jose, Calif. did exactly what you shouldn't do if you stupidly decide to steal a car: attract a lot of attention in a residential area. They not only crashed into a house Friday night, but caused an explosion after the crash ruptured a gas line. According to the San Jose Mercury News, someone in the area was listening to a police scanner when he heard police were involved in a pursuit with a 1991 Toyota Camry that was originally stopped because it was driving without headlights on – again, something that would certainly draw attention. 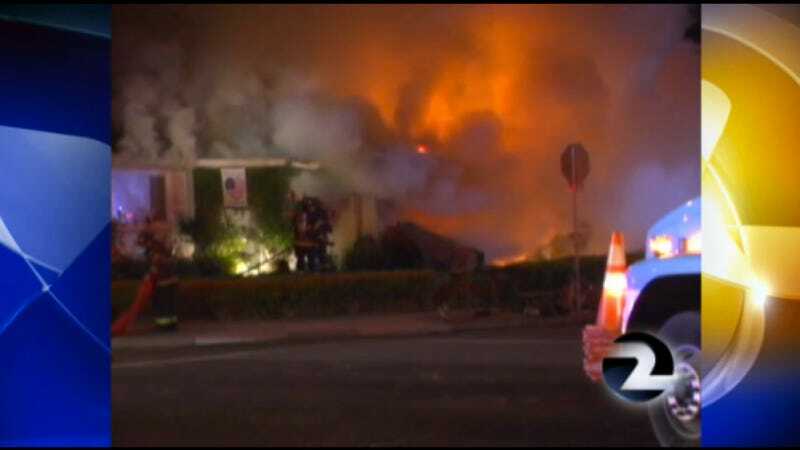 After a short pursuit, police reported the car going into a house and resulted in an explosion and a two-alarm fire that gutted one house and severely damaged another. Amazingly, no one was seriously hurt in all of this. NBC Bay Area reported some fish and a dog survived the incident, too, which is good. Also amazing was that only the driver of the stolen Camry was booked, while another person in the car was taken to a hospital to be treated for minor injuries and the other two were released to presumably angry parents on the spot. I'm guessing that was a very long, very awkward car ride home.